Pecans and Christmas just seem to go hand and hand! 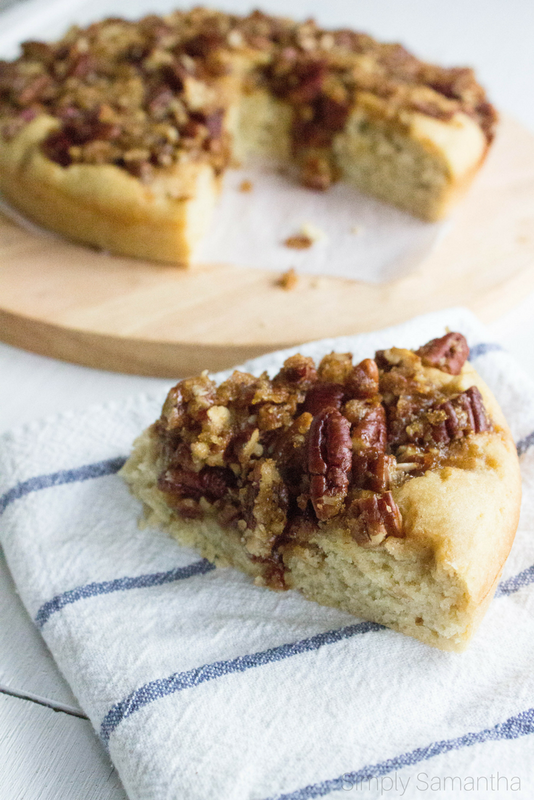 Last week I was brainstorming how I could make a tasty but easy treat with some pecans I picked up at the store. After a fail of one recipe, I attempted to make a simple cake topped with buttery pecan goodness. And what a buttery sweet goodness it was. 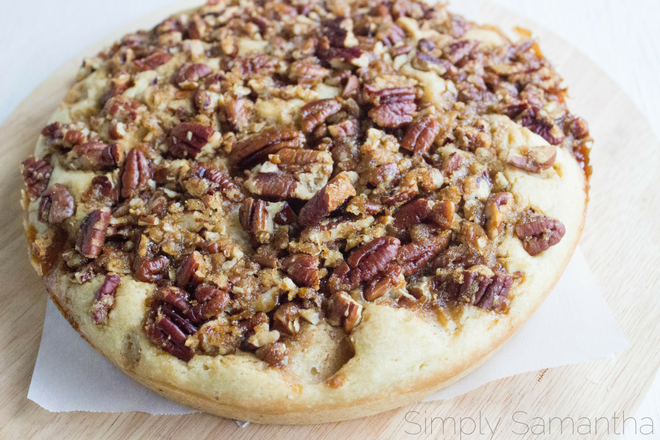 When I made this I topped the cake with the buttered pecans on the wet batter. While it still did cook well, I would suggest waiting to top the cake till 15 minutes left of baking, to get the cake time to cook and puff up. I topped this with some So Delicious whip cream over the weekend and it's PERFECT! Preheat oven to 350 and grease a 9in cake pan and set it asideIn a medium mixing bowl, combine flour, sugar, and baking powderNext, add the almond milk, butter, and egg. Beat all the ingredients together until well blendedPour into pan and place in the oven for 25 minutes. Here is where you can use your discretion. I originally placed the pecan topping (recipe for that below) on top at the very beginning. However, it took longer to cook. 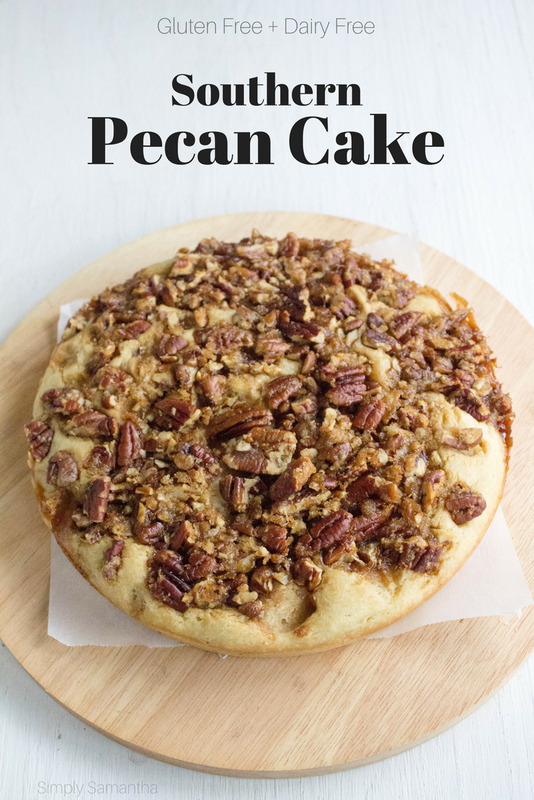 My suggestion now is to let the cake cook the 25 minutes then add the pecan topping and let it cook another 5-10minutes. Pecan Topping - melt another 1/4 cup of dairy free butter in a small saucepan or in the microwave. Once melted add 1/3 of sugar and 2 cups of chopped (roughly) pecans.Once you can insert a toothpick and it comes out clean, pull the cake out and let cool on a wire rack. Store at room temperature as long as possible in a safe cake dish. It will stay softer this way. MMM. Looks delicious. Should be a Christmas Day Dessert.